The heaviest losses of U.S. warships occurred in the last year of the war, due to Japanese kamikaze attacks. In the first three months of the suicide attacks (from October 25, 1944), the kamikaze pilots damaged 50 American ships. They continued in large numbers until the very end of the war. On April 16 alone, during the Okinawa campaign, over 100 kamikaze attacks were launched, sinking the destroyer Pringle, and hitting 11 other ships. Among the badly damaged was the Intrepid, with a 12 by 14 foot hole in the flight deck, 40 planes destroyed, and 9 men killed (the second kamikaze hit on Intrepid). Aboard nearby Yorktown was the most successful fighter division (4 planes) of the war, known as "Valencia's Flying Circus". Eugene Valencia was born in San Francisco, California on 13 April 1921 . 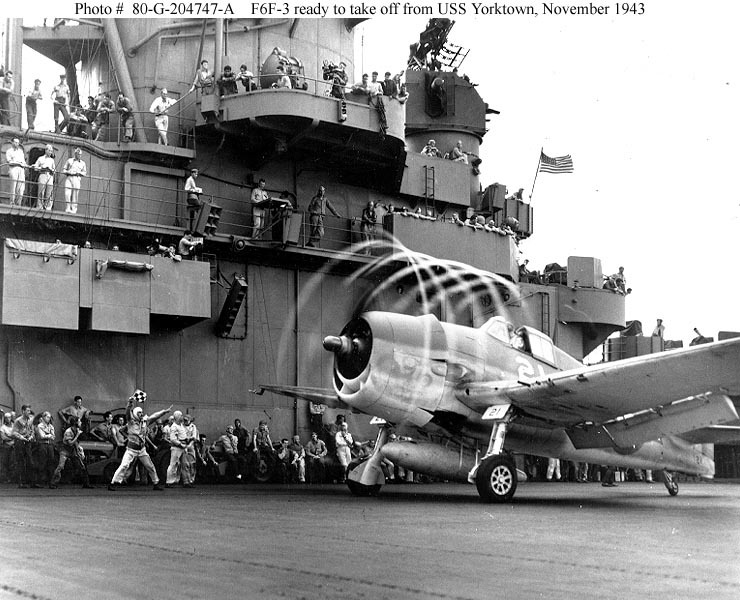 (This Yorktown was CV-10, named in honor of the carrier lost at Midway.) After attending San Francisco Junior College, Valencia joined the U.S. Navy as an aviation cadet in mid-1941, and trained until April 1942. After a stint as an instructor, he was assigned to the brand-new Essex in February 1943. With Essex, he scored his first aerial kills, shooting down 3 enemy planes over Rabaul and 1 over Tarawa in Nov. '43. 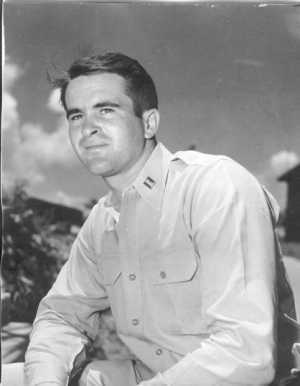 Over Truk on Feb. 16, 1944, he became separated from his wingman, Bill Bonneau, and was attacked by several Zeros. They chased him at length and fired repeatedly, but couldn't hit him. Figuring that their poor gunnery didn't threaten him too much, Valencia swung around to face his attackers, and shot down three in short order. On his return to Essex, he exuded enthusiasm for the Hellcat, saying, "I love this airplane so much that if it could cook, I'd marry it." At Truk, he spotted a weakness in the enemy's fighter tactics, from which he developed his famed "Mowing Machine." Returning to NAS Pasco, Washington for more training, he recruited three promising pilots to work with him: James French (who finished the war with 11 victories), Joe Roquemore, and Clinton Smith (6). They worked relentlessly, flying over 100 hours a month. They even resorted to bribing the service crews with booze, in exchange for the extra, unauthorized fuel they needed for their extra flight time. Roquemore died of pneumonia before they reached Hawaii, and Valencia recruited Harris Mitchell (ultimately 10 kills) to fill in. The intense and mercurial Valencia strove to build an esprit de corps in his division: requesting purple lightning bolts on their Hellcats (denied), decorating their helmets flamboyantly, and securing mint juleps or champagne for the division's pre-flight refreshment. When this division and others of VF-9 were ready, they returned to the Pacific, serving briefly with the new Lexington (CV-16) in Feb.- Mar. 1945. This was the new VF-9, an entirely different outfit than the VF-9 that flew from Essex in 1943-44. Barrett Tillman's U.S. Navy Fighter Squadrons in World War II does a great job in unscrambling the different squadrons, their deployments, their aces, and C.O.'s. On Feb. 15, VF-9 escorted a raid on Tokyo (the first in 3 years). Still led by CO Lt. Cdr. Herb Houck, they launched the first morning sweep less than 100 miles from Japan. They made the Honshu coast flying through rain and snow, something they hadn't expected to encounter in the Pacific, but VF-9 fliers didn't see much action on the day's first mission. That afternoon, they went up again, Valencia's division flying with CAG Phil Torrey. Valencia spotted a bogey high and behind them. He racked his Hellcat around and challenged the Tojo head-on, first firing his rockets. Mitchell came up to help, flamed the bandit, and saw the pilot bail out. The division re-formed and continued hunting both aerial and ground targets. Valencia got two more, while French and Smith got three between them. The "Flying Circus" came back from its first combat mission with six confirmed kills, with no damage to their Hellcats. But CAG, Phil Torrey, had been lost. In March VF-9 joined USS Yorktown, CV-10 (a new Essex-class carrier, the first Yorktown being sunk at Midway), a part of Task Force 58. TF 58 participated in the difficult Okinawa campaign, which the Japanese defended fiercely from March until June 21. On the morning of April 17, VF-9 was flying Combat Air Patrol (CAP); Jap air attacks were expected. Before dawn Valencia and the other Hellcat pilots launched and began the climb to 25,000 feet. Patrolling to the north, Valencia had a good chance of encountering the Japanese. The Hellcats circled on reaching altitude, and continued uneventfully for an hour. But then Yorktown's radar room reported contacts to the north, which Smith soon spotted. "Tally ho! Bogeys! Three o'clock!" The closest pilot, French (a wingman), headed toward them; the division had trained so that any one of the four could take the lead. From ten miles out, the enemy seemed to number about 20 or 30. But as the distance closed, Valencia estimated 35 or 40. Closing further, French called out "There must be fifty of 'em!" French and Smith led the first diving attack, with Valencia and Mitchell as top cover. The enemy formation didn't react; French and Smith both fired and hit the bomb-carrying Franks, which disintegrated when their high explosives were hit. These two crossed and pulled up to cover Valencia and Mitchell, who then rapidly closed with the enemy gaggle and exploded two more Franks. The four Hellcats then reversed direction, while the Japs continued on their southern course, gambling that they could reach the American fleet before the Hellcats decimated their planes. Valencia and Mitchell led the return, closed in, and exploded two more Franks. French and Smith repeated the well-practiced "Mowing Machine" and shot up two more planes. After this, the Japanese dispersed, and Valencia radioed "Break tactics. Select targets of opportunity." The Franks, Zeros, and Oscars scattered widely, and Valencia's division split into pairs, pursuing as well as they could. To his relief, some other Hellcats joined the interception, as the Japs were closing in on Yorktown. Valencia got onto another Frank's tail, and opened up from one hundred yards. Smoke streamed back and the Frank exploded. Victory number 3 for Valencia! So far his division had scored nine kills and two probables! Valencia spotted three other Franks, and was briefly distracted by tracer fire, which turned out to be from Mitchell. Recovering, Valencia walked up on his fourth victim, and fires. Valencia stayed with his smoking target, while Mitchell clobbered another Frank from the same trio. Soon these two went down, upping the division's total to eleven, and Valencia's to four. Maneuvering, he then went for the remaining plane in the division, and poured shells into it. Victory number 5! All over the sky, American planes were downing the Japanese attackers. Valencia spotted a Frank on the tail of two unsuspecting Hellcats (intent on their own targets); he picked up speed, came within range, and pulled the trigger. His win number 6 saved the other Hellcat pilot. By this time his division had racked up 14 kills. At this point, low fuel forced Valencia to head back for the Yorktown. He rendezvoused with Mitchell, and circled, hoping to pick up French and Smith. A stray Jap fighter came too close, and Valencia stood on a wing and made for him. But as he pressed the trigger, nothing happened. His guns were empty! Valencia radioed the Yorktown and received permission for him and Mitchell to land. They thumped down their dirty, but unhurt fighters, followed shortly by Smith and French. The division had scored seventeen confirmed kills and four probables, their best day of the war. The Flying Circus continued its deadly work. Seventeen days later, they knocked down eleven enemy aircraft. Then on May 11, they scored another 10 kills, all in defense of the fleet. 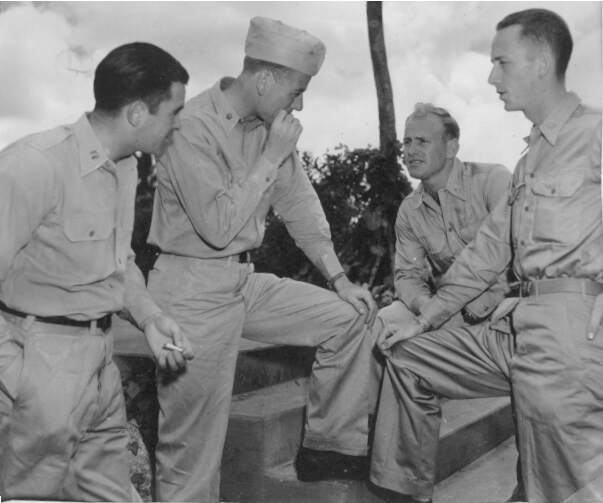 By the end of the war, all had become aces, Valencia leading them with 23 kills, and receiving the Navy Cross, five Distinguished Flying Crosses, and six Air Medals for his heroism and leadership. A founder of the American Fighter Aces Association, he died of a heart attack at a reunion on September 15, 1972 . The fine photographs here of Valencia, his CO - Lt. Cdr. Houck, and others were sent to me by Jack Whitesell, a WW2 vet himself, and high school classmate of one of the fliers. Jack, I salute you. A man who served his country so long ago, and is now helping the next generations see some of what happened.